The Mint Bar Stool Brown is an indulgent item for your kitchen or bar area. Ergonomically designed with cool and contemporary styling, the Mint is both fashionable and functional and will therefore accompany a multitude of different décor settings. With a sumptuously padded seat, this is a very comfortable piece of furniture. 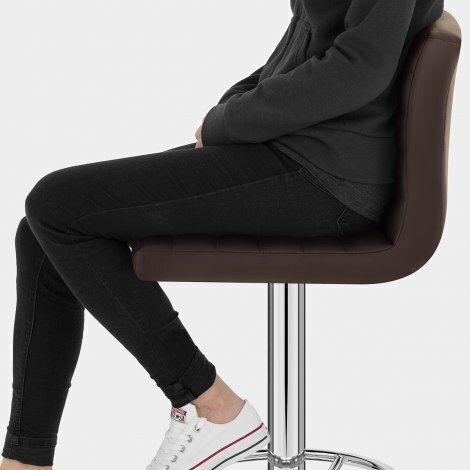 Covered in brown faux leather stitched into segments, the seat rises up at the rear into a tall backrest, which offers good support for the entire back, making the Mint a relaxing place to sit. Helping this comfortable feel is the hand-fashioned footrest, plated in chrome and mounted on the similarly plated column, below which is the round base. This base comes with an integrated floor protector, designed to keep your floors free from scrapes and scratches and ideal for a tiled or wooden kitchen bar or breakfast bar. 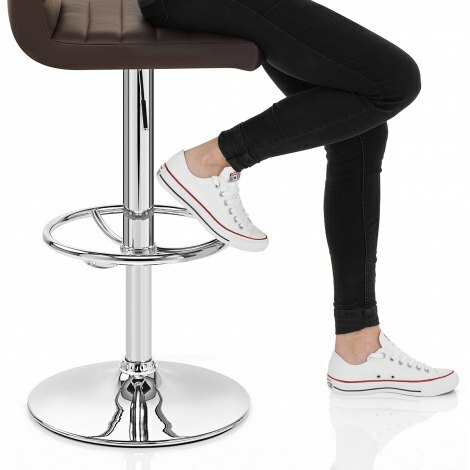 A gas lift mechanism gives the Mint adjustable height and 360-degree rotation, allowing you to tailor the stool to fit your needs. "These fitted the bill for comfort, style and price"
Ordered due to 5 star reviews & didn’t disappoint. Quick delivery & easy to assembly. Super comfy & very stylish. Really happy & wouldn’t hesitate to order from them again. Bought four of these stools to replace some very similar ones that we bought about 7 years ago and required replacement. 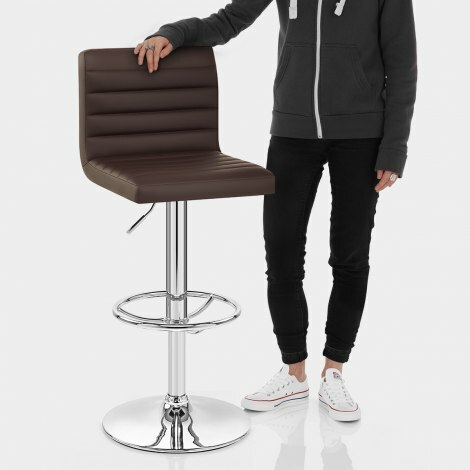 Very good service, stools arrived the following day and were very easy to put together. Excellent item, great quality and they look really smart at the breakfast bar. They are actually a lot more padded than I thought they would be. Brilliant customer service and delivery time. I will definitely be using Atlantic again! Great service, ordered one day had stools by 10.30 next morning ! Really comfortable and they look great. Highly recommend stools and Atlantic shopping. Thank you. These are excellent quality and the service was fantastic. I had a slight fault with one and a replacement was sent immediately. Look great and very comfortable.